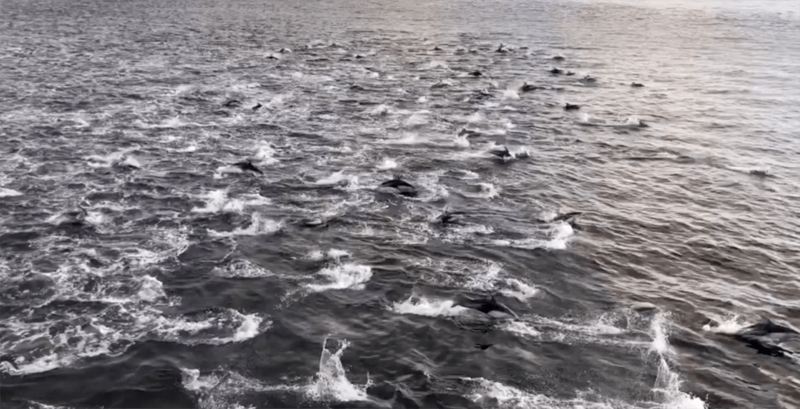 BC Ferries passengers were in for a treat on Tuesday, December 4, when a large pod of dolphins were caught travelling alongside an early morning vessel. Henry Irizawa was one of the lucky passengers who got to witness the spectacle first hand and was able to record it through his phone. According to Irizawa, the pod of dolphins was spotted on the 8:25 am ferry travelling to Horseshoe Bay. Irizawa was on his way to Rogers Arena. “The captain was quite excited when he said on the PA ‘there are 200 dolphins ahead'” he explained over Facebook. At that point, he made his way to the bow of the ferry on the top car deck and captured the moment on his iPhone. A few other passengers were also able to record clips of the rare sight. No matter where you’re going or what ferry you’re on, it’s safe to say that travelling with a pod of dolphins is a breathtaking way to start the day. Passengers were treated to a similar sighting on Monday, December 3, although the pod captured on video was much smaller.